I went back to bed but no sooner had I done so when I felt what can only be described as "a gush." I leapt out of bed and ran back to the bathroom. I flicked on the light and was filled with horror (and started freaking out accordingly). "Andrew!" I shrieked. "I'm bleeding! Help me!!!" I have never known that man to move so quickly. He was out of bed, dressed, and standing at the bathroom door in ten seconds flat. He dug around in the bathroom to find a pad for me to wear (we hadn't purchased any for post-partum bleeding yet because we still had seven weeks to do that...and I hadn't used any for months because...pregnant, remember? We're lucky he found a nice thick one). I threw on a nightgown and then we both ran around like a couple of sharks in a feeding frenzy, grabbing things and occasionally crashing into each other and muttering, "What do we do? What do we do?" It took us all of three minutes to get out to the car. I managed to grab: a towel to sit on, some clean underwear, our insurance cards, and a Sunday dress (because we so obviously were going to be discharged in time for church), and my glasses. Andrew managed to grab: his cell phone, wallet, iPod, car keys, and jacket. We were so prepared. Not. We rushed to the emergency room and, fortunately (because it was 2:30 in the morning) there wasn't any traffic so it didn't take long. I was so busy counting kicks and trying to keep track of contractions that I can't even tell you if we hit any red lights. When we got to the ER, we bustled through the door. "I'm only 33 weeks pregnant and I'm bleeding," I gasped. "We need to get you upstairs to labour and delivery," the lady at the front desk said and ran off to get a wheelchair. Andrew and I didn't even know where labour and delivery was. Touring the hospital and pre-registering for the birth was totally on our list of things to do...at 36 weeks...because they said to do it four weeks before your baby's due date. "Hey, look!" I said as I was wheeled through the halls at top speed. "A tour of the hospital!" When we got up to labour and delivery and they started asking us all sorts of questions, Andrew said, "Hey, we're pre-registering early! Now we won't have to come back and do it later." We still didn't think we'd be having Benjamin that day, obviously. I was escorted into a triage room where I put on a gown and then was hooked up to some monitors so they could keep an eye on the baby's heartbeat and the rate of my contractions. The nurse tried to get me to rate my pain. I told her that I wasn't very good at pain scales. She said to try anyway—with 1 being minimal pain and 10 being just-hit-by-a-bus. "A four, I guess," I told her, shrugging my shoulders. She left to look at the readings from the monitors and then ran back into the room. 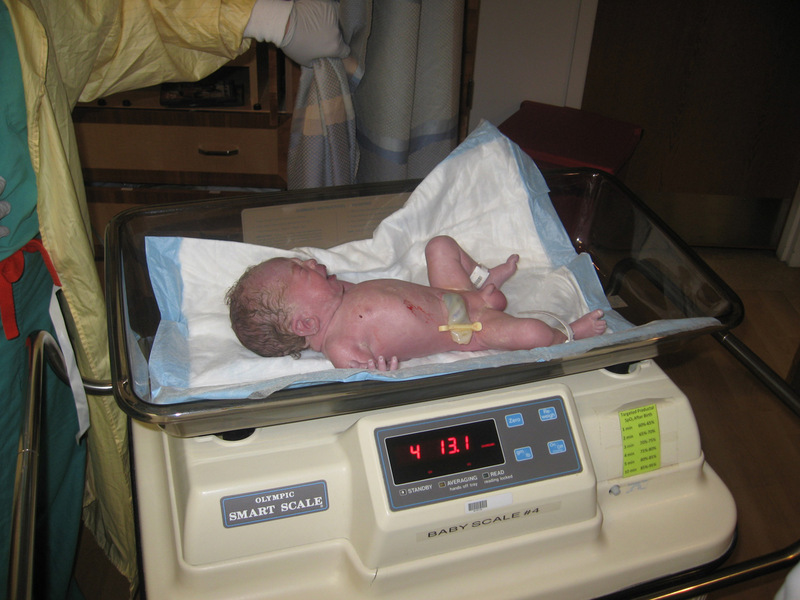 "Umm, you are having contractions every 4–8 minutes...and you rated your pain a...four?" "Yeah, I told you I'm not good at rating my pain. 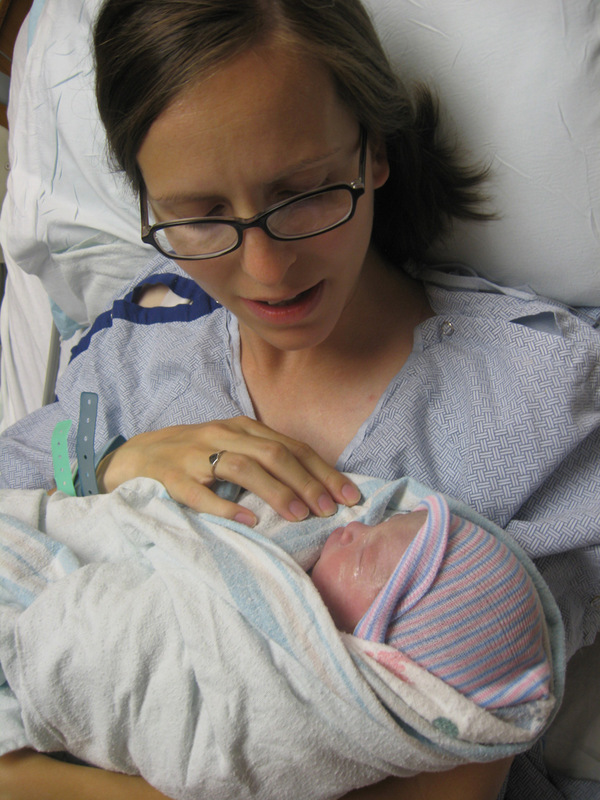 With my first baby I walked into the hospital dilated to a nine and rated my pain as a seven. I always think the pain could be worse and I'm really good at ignoring pain. I never seem to be able to rate my pain with an accurate number." She said we'd just throw out the numbering system and then proceeded to try to give me an IV. She blew a vein in my left forearm on her first try. Now that? That hurt more than any contraction I'd had all morning, at least initially. She tried again on my right arm and blew a vein in my wrist (which is still mottled red, purple, green, and yellow; it's cute (or makes me look like I get abused)). Then she called in another nurse who took one look at my veins, went off to find a smaller needle, and got the IV in on the first try. It was not very fun. So I sat there with an IV dripping into my system while they monitored my baby and contractions and got in contact with our doctor, who ordered an ultrasound because he was afraid I'd developed placenta previa or had an abruption or something and didn't want to risk poking around my cervix if they were going to puncture my placenta. The trouble with IVs is that they make you need to go pee really bad. So do contractions. The trouble with needing to go pee really bad when you're hooked up to a bunch of monitors and IVs is that it makes it rather difficult to make a trip to the bathroom. Andrew helped me cart all my stuff to and from the bathroom what seemed like a million times before we finally got called down to get an ultrasound. The technician poked around for a while before she found the placenta, which was up out of the way and showed no sign of abruption. She noted that I seemed to be contracting a lot and said she'd like to also check my cervix so she started sweeping my abdomen with with her probe. "Okay," she said. "Did they check your cervix upstairs?" "They didn't; they said I needed an ultrasound first." "Well, we need to get you back upstairs right away. I can't even find your cervix...because your baby's head is fully engaged and is blocking my view." We rushed back upstairs where the nurse got the okay from our doctor to check my cervix. She checked me once and kind of gasped. Then she checked me again and shook her head. Then she checked me a third time and said, "I don't believe it! You're at a five!" "No, no, no, no," I said, gulping down air and choking back tears. "You are," she said, and rushed out to call the doctor. She came back in a few minutes later to tell me that our doctor would be here in a few minutes and that there were a few things they needed to do. The first was to give me a shot of tributiline to try to stop labour from progressing any further. That hurt like a bee sting. The second was to give me a steroid shot (right in the hiney) to help the baby's lungs develop. That hurt like the dickens. Then I got an antibiotic hooked up to the IV since I hadn't had my strep B test done and because the baby was premature and they didn't want to take any risks. I was still having a few contractions so they gave me a second shot of tributiline just before the doctor arrived. He came in and explained that because I was at a five I should expect to be in the hospital until the baby was born. He didn't know if that would be today, tomorrow, next week, or next month, but there was no way to un-dilate the cervix so it would be hospitalized bedrest until the baby was here. Then he said that because I was less than 34 weeks they'd prefer to transfer me to UVRMC but he'd have to check me first to see if labour had stopped progressing. "Well, you're at a seven now," he said. "So you'll be delivering the baby here and you'll be delivering the baby today. Let's stop trying to stop this thing and just let labour progress. 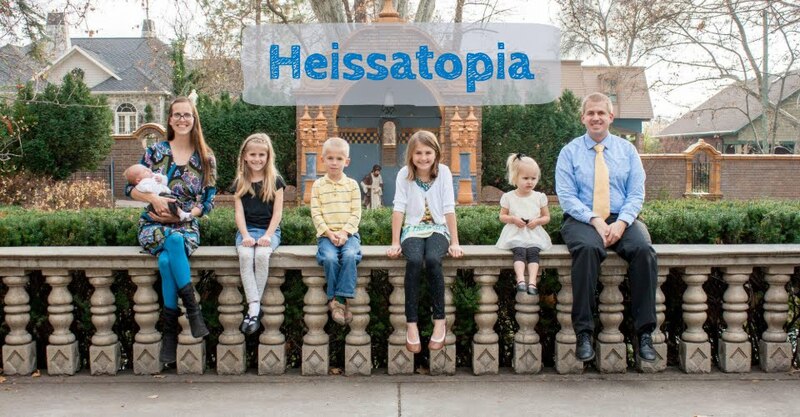 We'll have a whole team ready to work on you and the baby so you don't need to worry about a thing." Like not worrying was even a remote possibility. We were completely in shock. I was shaking so badly that they brought me a warm blanket—it felt like it was fresh out of the dryer—and then kept replacing it as the heat wore off. I was a complete mess of emotion. They moved us out of the triage room and into an actual labour and delivery room and then we sat and waited for this baby to come. It was kind of boring, to be honest. We'd never had to wait around for a baby to born before and hadn't brought anything entertaining to do. The tributiline seemed to have slowed my labour down at least a little bit. It took over an hour to go from a 7 to an 8.5 and then I seemed to just pause there while my cervix continued to efface. Reid came over to help Andrew give me a blessing. We hadn't brought a camera with us so asked him to grab the diaper bag and bring it in with him but the camera wasn't in the diaper bag so it was wasted effort. He was pretty bummed because the diaper bag is pink and he had to carry it all through the hospital for nothing. My dad and Josie came to visit with us for a while, too (and brought Patrick's camera to leave with us). They helped pass the time and lighten the mood a little. Our doctor came to talk to us about getting an epidural. He knew that I wanted a natural birth and that I was capable of a natural birth and he was fine with doing a natural birth. However, he said he'd likely end up giving me an episiotomy if we ended up doing a vaginal delivery just to make sure that the baby had plenty of room to pass without getting squished and bruised. He said he could give the episiotomy without the epidural but that would be highly uncomfortable. There was also the risk of c-section—if the baby started to go into distress or managed to flip around to breach (my water was still in tact and the baby still so small and maneuverable) or anything then they'd have to do a c-section. If that happened and I didn't already have an epidural in place then they'd have to use general anesthesia and put me completely under. But ultimately the decision was mine. Andrew and I talked it over for a while. I didn't really want an epidural but at this point we could only see benefits. First of all, it would slow down labour. The doctor kind of wanted to give the steroid shot 24 hours to give Benjamin maximum benefits. Slowing down labour would bring us closer to the 24 hours mark. Second, I could have a catheter. By now I was on my third IV and had to make multiple trips to the bathroom per hour, dragging all those blasted monitors with me and I was sick to death of it. I thought a catheter would bring sweet release (it did). Third, I was so tired and wanted to rest. I hadn't slept since the morning before and I was still shaking and unable to relax. 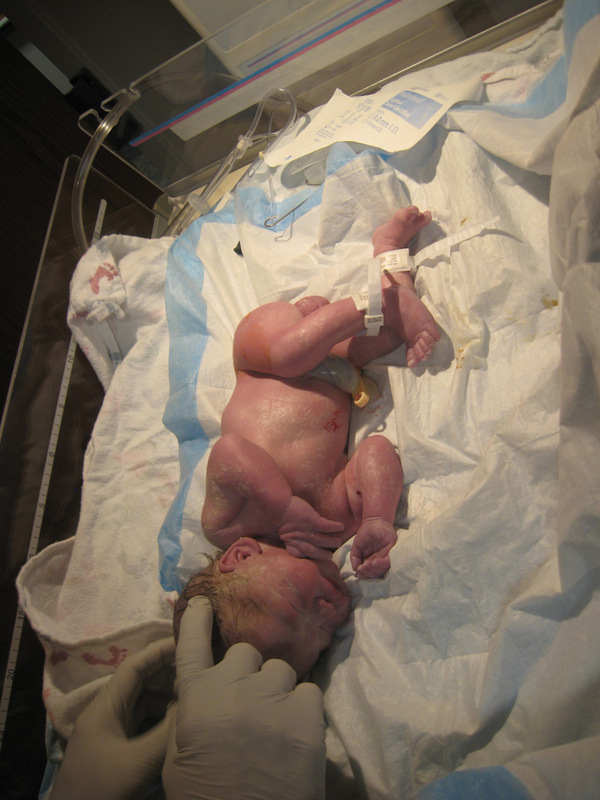 Fourth, if I did need to have a c-section I wanted to at least be able to meet my baby before they sent him away from me. We consented to the epidural. "Just let me know when you're ready for it, then," the nurse said, "And I'll call the anesthesiologist over. He's already here and won't be leaving for a while so there's no rush." Great. I had to decide when I "needed" the epidural. I was already stalled at an 8.5, having contractions every six minutes, and yet they were completely manageable. We decided just to get the epidural so that I could get the catheter so that I could sit in bed for longer than fifteen minutes without feeling like I was going to wet the bed. My dad and Josie left after I got the epidural (or before?) so that Andrew and I could nap. Andrew took a serious nap. I got to doze a little between blood pressure monitorings (but even my little naps felt so refreshing). I don't know how long it was but I still hadn't progressed much and the nurse was getting antsy. "Maybe I should call the doctor in to break your water," she suggested. I had a whole repertoire of reasons not to do this ready for the doctor (such as: there's a higher risk of the cord dropping and wrapping around the baby's neck, there's a higher risk of infection for the baby the longer the water's broken, and we don't really need to speed things up anyway) but the doctor was on the same page as me and suggested that we just wait. The baby was doing fine. I was still progressing, if not slowly, and now that I had the epidural I could labour all day long without getting too worn out. And our goal was to labour as long as possible. I was impressed with our doctor's patience, really. 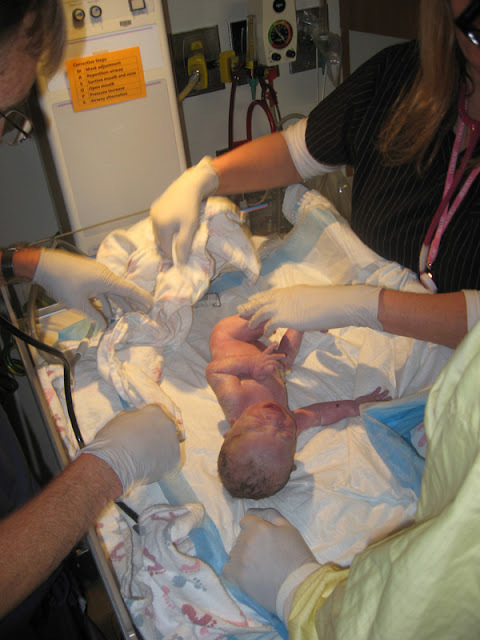 With both Rachel and Miriam my doctors were like, "Let's get this baby out of there! PUSH! PUSH! PUSH!" Miriam's doctor even threatened to break out the pitocin...and I was only in labour for four hours with her. This time my doctor was content to let things work out slowly (if eleven hours can be considered slow; for me that's a nice long labour). When we got tired of napping Andrew went off to find the DVD cupboard and came back with Get Smart. He said almost everything in the cupboard was dumb but that he'd watched part of this in Ghana and it was okay. He put it in and I tried to watch it but instead ended up watching my monitors. I think all I needed was a distraction to throw me into transition. I started to be able to feel the contractions a little and they were rapidly firing away. Unfortunately I couldn't feel them strong enough to tell if I was ready to push so I buzzed for my nurse who came in to check me and confirmed that I was complete. Then things got really crazy. People started filing into the room, wheeling equipment, putting on gloves and masks and gowns. We had my doctor and nurses, a couple of NICU nurses, a couple of respiratory therapists, a pediatrician, an intern, and a couple of other people. They all introduced themselves and said not to worry, that it was just going to be like a big birthday party for sweet baby Benjamin. I had to be told when to push since I couldn't feel my contractions and my contractions still weren't very regular. The doctor and my nurse were watching the monitor to see when my contractions were coming and kept saying, "Here comes...never mind...okay, here's one!" We did three pushes per contraction. I did one set of pushes and they could see his hair. On the second set of pushes the doctor helped my water to break. After that I think is when he gave me the episiotomy. But he tried not to—he had been massaging my tissues and giving great counter pressure but Benjamin ended up being a little bigger than we imagined and he didn't want to bruise his head. So on the third set of pushes I only had to push once before Benjamin popped out. He immediately started crying and then promptly relieved himself, spraying everything and everyone around him. "Well, his bladder works just fine!" the doctor laughed. They whisked Benjamin off to various stations—he rocked his apgar test (he was pink and squalling) and seemed to be breathing fairly well. He weighed in at a surprisingly large 4 lbs. 13 oz. and measured 16.5 inches. Everyone was very impressed with his weight and cheered when it registered on the scale. It's good to be big when you're a premie, I guess. 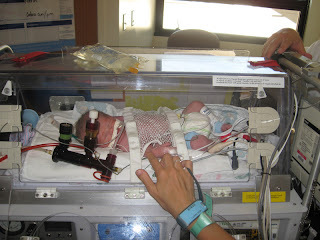 I got to hold him for a minute before they rushed him down to the level II nursery (there's no NICU at American Fork). Andrew followed him and I was left on my own. With a million medical professionals still milling around, so it wasn't too lonely. The doctor wanted to stitch up my episotomy wound quickly because I was losing a bit of blood so instead of letting me birth the placenta he gently tugged it out. I was kind of sad because birthing the placenta is so easy. Having it yanked out of you is...not as easy. But it came out in tact and I got stitched up, congratulated, and then left on my own. Fortunately my dad and Josie and Patrick had been out waiting in the foyer (we didn't know they were there; we told them not to bother coming in yet because nothing was happening but then once it happened it happened so quickly that we didn't call them back...but I guess they just came anyway, which was nice) and so they kept me company while Andrew helped get Benjamin settled on the ventilator (and by "helped" I mean "watched"). We stopped by the nursery to see Benjamin on the way down to my recovery room and I choked back tears while I held his tiny hand. Karen had brought the girls to the hospital after church and they got to have a glimpse of him through the window. They visited me in my room for a minute before leaving to go to the BYU ward (break-the-fast; Karen was pretty busy). Then the life flight team brought Benjamin to say goodbye before they whisked him away to UVRMC. He only rode in an ambulance, not a helicopter (something he might find a little disappointing when we tell him this story in a few years; but it's still cool for him—I've never been in an ambulance). He got a t-shirt from his ambulance crew with a little life flight helicopter on it. It's size 6 months, so I don't know when he'll be able to wear it. Right now we could probably fit four or five Benjamins in that t-shirt! After about an hour, Andrew left me to join Benjamin at his hospital. I sat in my room all alone, trying to nap but failing royally. I was too worked up about the day and was really happy when Andrew came back. He came back at around 8:00 PM and I showed him what a big girl I was because I could finally stand up all on my own. Benjamin was born at around 1:00 PM and that's when they turned off the drugs in the epidural. It took my seven hours to be able to stand on my own two legs. And that's just one reason I'm not a fan of epidurals. Though I must say that even though I prefer natural births I am so grateful for modern medicine. Sometimes things don't go quite as planned and modern medicine sure made a happier ending for us! We had a few other visitors later in the evening: my mom, who got off her plane and headed straight for the hospital, came with Josie and my dad. Then my Kelli stopped by with my niece Rosie. It was nice to see them and have the distraction of conversation for a while. 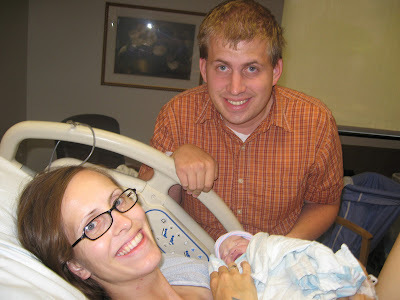 I'll keep adding to Benjamin's birth story as I see fit. After all, he's not quite finished being born, is he? He just turned -6 weeks yesterday! Great story and I'm so glad things are going well! Hard Nancy. I'm m glad he's doing so well. Hoping he comes home soon!!!! Wow! What a story. You are amazing. What a beautiful little man you have. So moving... Benjamin really wanted to come, didn't he! He's so beautiful. Just saw the picture with no "oxygen". Hurrah!!! I BEGGED to have epidurals on each one, although the first one was a must because things were too risky. I'm SOOOO glad all is well and that little Benjamin is doing so well. He's such a cutie and I can't wait to meet him! Wow Nancy! You are an amazing woman for going through that and still be able to insert humor here and there! God bless little Benjamin! He will be in my prayers. Oh, Nancy! Your story has brought back so many memories for me of the births of my babies. I even cried a bit. My first was a natural delivery, healthy baby. Second, born at 34 weeks, c-section because of placenta previa. Third, in Level II Nursery w/a heart condition. Fourth, in Level II with neonatal pneumonia. It will get better. Just hang in there and let others help you as much as they can. What a blessing to have family nearby. We are so grateful to have our families close by and the ward has been wonderful as well. I know what you mean about the epidural. I don't know what I would've done... it's hard to think you don't really NEED these things but they might help the baby have a more smooth transition to the world when they are so early. Well, happy he is here safe and (relatively) sound! I don't think I'd read this before... I didn't know they pulled the placenta out if you're losing too much blood (they pulled mine out with Beth). I wish to goodness I'd had an epidural for her, but we were in a birthing center til the last minute. Piggy-backing contractions are NO FUN. Sadly, my natural birth experience was completely different than yours have been, and I'd rather be shot than try it that way again... lol. Beth is 18 months old now and I'm only JUST starting to feel like, "OK, maybe I'll try for ONE more kid..." hah.